Pain Awareness Month is right around the corner. September is always a busy time for most of us. These are just a few of the Power of Pain Foundation’s events and activities during that time. Please feel welcome to join in on the events you are able to. We have other’s we are involved with from State to State. We look forward to all that you are doing for the mutual cause we share as well as the hope and fight for a cure we all work so hard for when raising awareness. If you have an event you would like me to share, please feel free to contact me. I wish you pain eased days and nights, ~Twinkle V.
Dr. Daniel Twogood, D.C., has been practicing chiropractic medicine in Southern California for 30 years. The doctor will describe 10 steps necessary to lower or eliminate chronic pain. This program does not work for everyone, but is noninvasive and we hope that attendees take away a few good pointers from it. This webinar not a cure, it is a tool to help people manage their chronic pain. Dr. Twogood will discuss that chronic pain is caused by ongoing inflammation which is caused by specific substances in the diet, food additives & medication. He was also on the blogtalk show Living with Hope, sponsored by the Power of Pain Foundation in May 2013. Over 100 million Americans suffer with some form of chronic pain such as back pain, fibromyalgia, migraines and arthritis. His book is easy to read and lists the ten steps necessary to eliminate chronic conditions fibromyalgia, headaches, psoriasis, Crohn’s disease and more, based on this doctors findings over all the years he has been practicing medicine. Where conventional medicine isn’t always effective, Dr. Daniel reports that relief is available by following these 10 steps outlined in his book. Most patients he works with recover well before 90 days. The Power of Pain does not endorse the presenter or their products. This is being offered as a tool that people in pain and their caregivers can listen to, ask questions, and start a discussion. 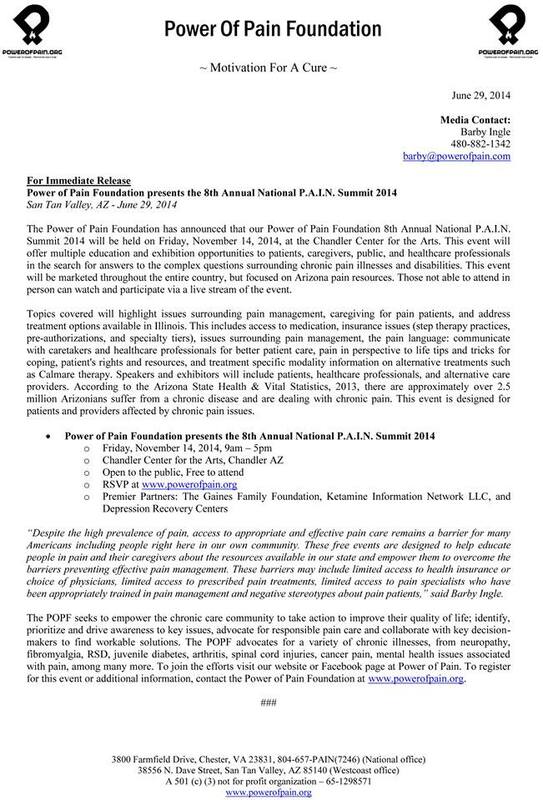 The 7th Annual P.A.I.N. Summit hosted by the Power of Pain Foundation provides a great avenue for pain education for providers, patients and their caregivers. This year’s conference consists of an exhibit area and educational sessions that focus on better diagnosis and treatment options for pain patients, chronic pain issues (as a whole), prescription monitoring programs, and Proper Opioid Management. There will be breakfast, lunch and afternoon snack provided to attendees. 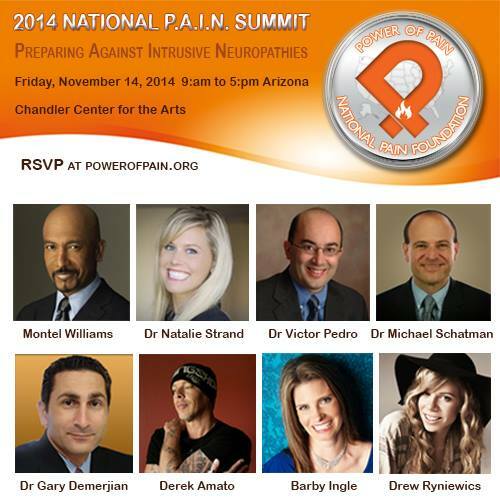 The event will be hosted by Brittany Brannon, Miss Arizona USA 2011, model, and RSD patient. The event will also feature two celebrity speakers, Dr. Natalie Stand, MD winner of the Amazing Race, and WWE star and professional wrestler, Raven. The day will consist of two sessions. 8am – 1:00pm The morning sessions are focused for healthcare providers. This includes all areas of expertise; anesthesiologists, complementary medicine specialists, emergency room, general practitioners, internal medicine, neurologists, nurses, orthopedics, pharmacists, physiatrists, physician assistants, primary care physicians, psychiatrists, surgeons, and therapists. Any clinician who practices, or is interested in practicing, pain management from an integrative perspective, will benefit from the meeting. HCP’s will be introduced to the rapidly expanding field of diagnosis and treatment. This conference will proved attendees a greater awareness and understanding of the need to appropriately identify, diagnose (HCPs only) and treat/seek treatment of common types of pain, including fibromyalgia, painful diabetic peripheral neuropathy and other chronic pain conditions. 1:30pm – 4:30pm The afternoon sessions will be filled with patients and their family/ caregivers. This portion of the conference will provide attendees a greater awareness and understanding of the need to appropriately identify, and treat/seek treatment of common types of pain. Come for the education, the experience, and the pure enjoyment! Join us at the Academy’s 2013 Annual Meeting, Exploring the Science, Practicing the Art and expand your knowledge and understanding about pain management, meet some of the most forward-thinking experts in the field, gain practical hands-on experiences, and have a great time! Who Should Attend – Any clinician who practices, or is interested in practicing, pain management from an integrative perspective, will benefit from the meeting. Comic Pain Relief 2013 presented by the Power of Pain Foundation for NERVEmber. More Info to come! Comic Pain Relief is a charity show to help raise awareness of chronic pain issues through a great social event using comedy. The event is open the public. The Comic Pain Relief show will take place to help raise proceeds and support for low income and under-insured patients who are affected by chronic pain conditions such as Post Cancer Neuropathy, MS, Lyme Disease, Diabetic Neuropathy and Reflex Sympathetic Dystrophy. Neuropathy pain conditions affect people of all ages, and races. There are over 100 million Americans with Chronic Pain. A full-color story book that will improve the daily lives of families that deal with the struggles associated with Chronic Pain. To understand the importance of this book, Watch the Video! Go to http://www.indiegogo.com/aunt-barby-hurts to make a contribution to this great project. Please make a contribution no matter how small, every dollar helps us reach the goal. This is a unique and worthy project to help our young population understand how to interact with those who experience some kind of chronic pain. Contributions can be as small as $1.00 and gifts will be given to the higher donations starting at only $10.00. Click on the image and see what its all about. 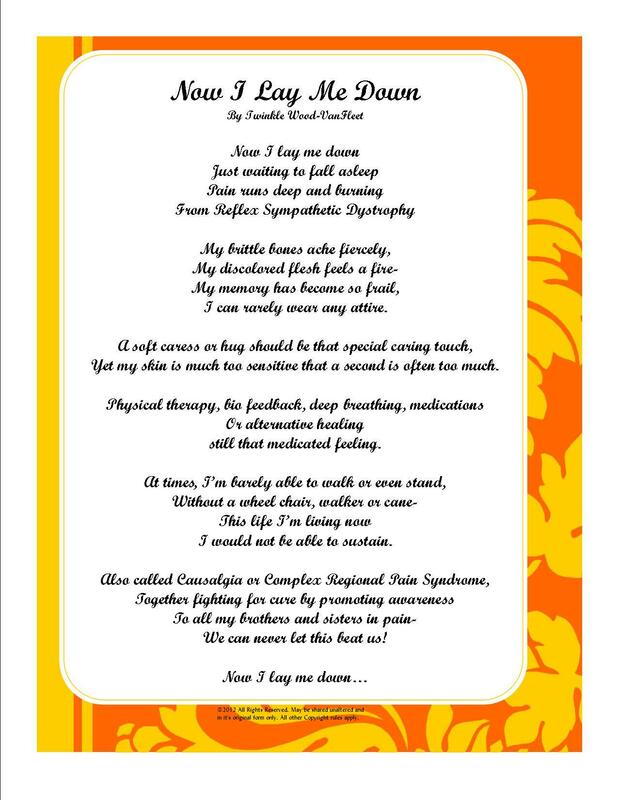 What we’re hoping to do, with your help, is create a children’s story book that deals with the topic of chronic pain. It will be a fully illustrated story; not merely an instructional handbook. And the goals of the book will be to introduce the idea of chronic pain, comfort children who know someone with chronic pain, and to help them learn ways of playing with, showing affection for and caring for that person. I was watching my son and his cousins interacting with their aunt Barby, who suffers with chronic pain. It was difficult for them to understand why they couldn’t give her hugs, or make loud noises. Looking at her, she doesn’t seem hurt; she doesn’t have a cast or even a band-aid. Chronic pain is often invisible, which makes it difficult for children to understand. They would forget and sometimes play too rough with her. Sometimes that would hurt her and she would cry out; then they would feel guilty, as if they are the one that caused her to be in pain. They even started to think the best thing was to leave her alone and play somewhere out of her way. But Barby wanted to play with them, talk with them and show them how much she loved them. Seeing this, I wondered how this might be playing out in other homes with family members who suffer from chronic pain. Over 116 million people in America have chronic pain. I thought there must be a good way to teach the children in these families all about it, how to help the family member cope, and how to play and have a great time with them: to have a normal full relationship. In talking with Barby, we agreed that a children’s story book would be the best way of dealing with this type of need. Tim and Barby will work together to create an engaging story that directly addresses many of the daily challenges of living with Chronic pain and presents them to children in a gentle and natural way. Once the story is complete, Tim will develop the artwork to bring the story to life. Tim is a fully digital artist, who works in Photoshop with a Wacom tablet. After the story and art are complete, they will be laid out for high-quality printing as well as developed into a digital app for phones and tablets. We’d like to dedicate this project in honor of NERVEmber 2012, the month for Neuropathy Awareness. This campaign will only receive funds if at least $13,999 is raised by Fri Nov 30 at 11:59PM PT. It’s crucial that this project receives it’s funding by the deadline in order to proceed. Most people don’t realize how far a dollar with go. If all of my friends, Barby Ingle’s friends, the Power of Pain Foundation’s friends, supporter’s of the Power of Pain Foundation, supporters of chronic pain and RSD/CRPS awareness can give a gift of $2 we could reach our goal. I say “we” and “our’ because this project has the potential of changing lives. Making happier lives. Teaching children how to interact with those of us in pain and helping us care for them while hurting. If you are a group, an organization, a business, please start a donation jar and donate no later than November 30th. I gave, will you give with me?